2 March 2013. 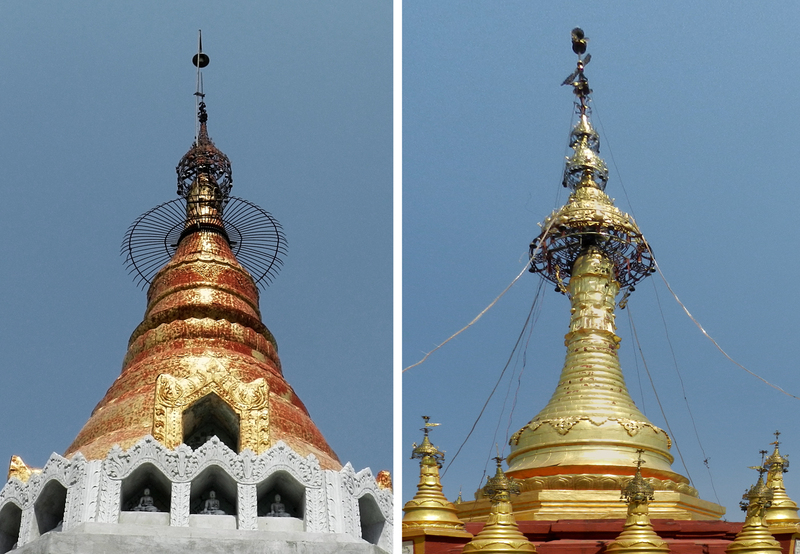 I first heard of Mount Popa, which is about fifty kilometres from Bagan, in Yangon, in a tourist agency. I saw a poster of it and of course I immediately wanted to go there. I had to see the real thing. On the way to Mt. Popa we stopped at a village devoted to the production of palm sugar. Palm tree flowers are not like flowers at all. They consist of several tube-like “spikes” about seven inches long and an inch or so thick, sticking out at all odd angles, and each is covered in tiny tiny flowers. To collect the sweetness from the flower each tube is nicked at the end and a ceramic pot tied to it to collect the honeyed liquid drops. This liquid, through a long slow cooking process is then converted into delicious palm sugar and palm candy. 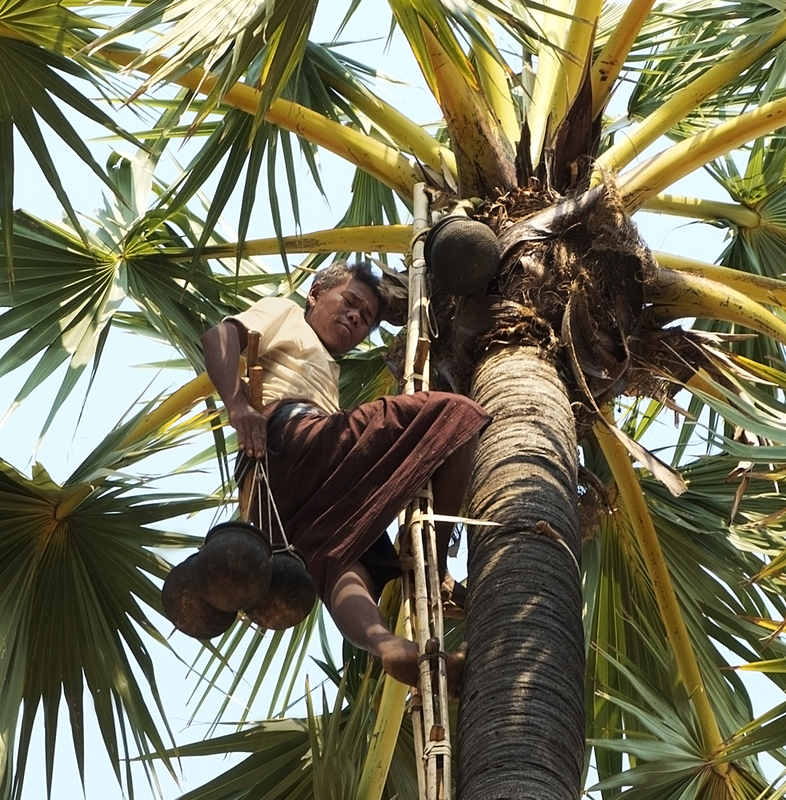 We’d been to a village in Cambodia where they make palm sugar and candy. In Cambodia they use bamboo containers to collect the liquid but the process is the same. This man is hanging the pots on the flower tubes. He is probably about eighty feet up. They are giants of trees, growing up to one hundred feet high and one hundred years old. In the same village we saw the production of peanut oil. It’s done in a huge wooden “mortar and pestle” contraption. 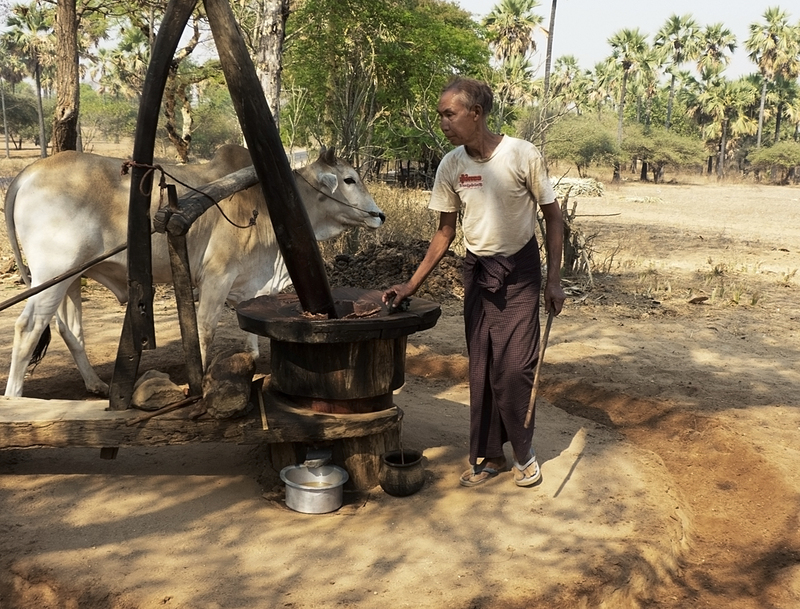 An ox is yoked to the pestle and encouraged to walk in a circle, no doubt for a very long time. The mortar is filled with peanuts, the movement of the ox turns the pestle around in the mortar and the peanuts are crushed into a paste. The paste is continually pushed back into the mortar, and slowly the oil dribbles out the bottom of the mortar into a clay pot: a long and slow process. It’s primitive, slow, inventive and effective. It always fascinates me how people think of these things, how they discover or invent them. Long before the “Industrial Age” and the invention of machinery people all over the world for thousands of years have been figuring out ways to make all kinds of things. For a start how did we even figure out that there’s oil in peanuts, and that it would be a useful thing to extract? For that matter how did we even know that peanuts are edible let alone figure out a way to get the oil from them? And in the same village – I find the children of course, always the children. They are drawn like curious magnets to the visiting tourists, and I with equal curiosity, and my camera, am drawn to them. They are spontaneous, uninhibited, unselfconscious, and often playful. On we drove towards Mt Popa and suddenly it is happening again. We are in the middle of a village having a ceremony for new monks. Only this time it’s not half a dozen boys, it’s about twenty or so of them, each on horseback! We are blown away, and immediately are out of the car and into the melee of people and horses and ox carts. What a scene we’ve landed in. 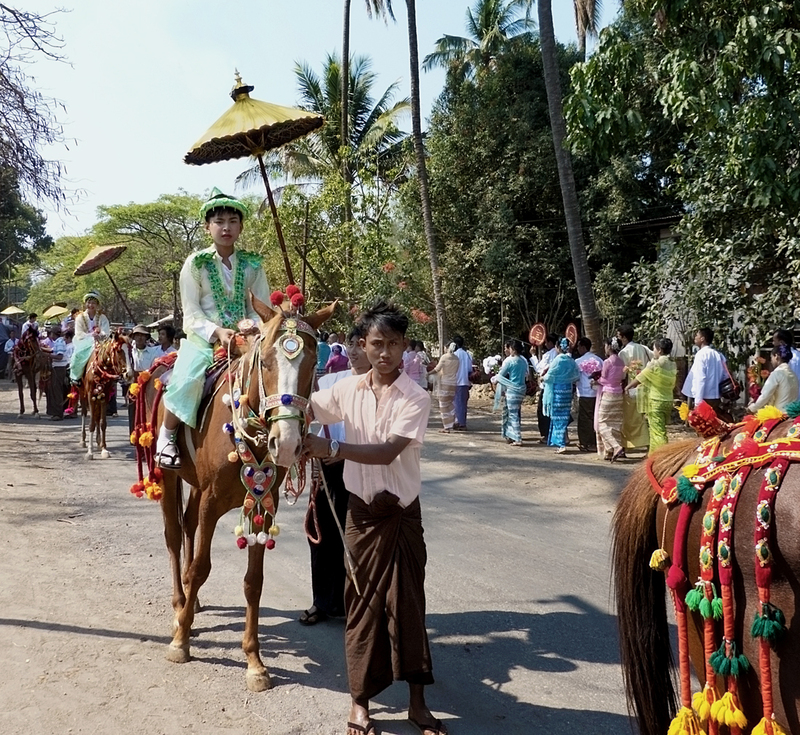 Each horse has a boy rider dressed as a prince to imitate the initiation of the Buddha’s son Prince Rahula, sparkling and shiny in the sun. By the end of the day, after the feasting, each will have his head shaved and will enter the monastery. 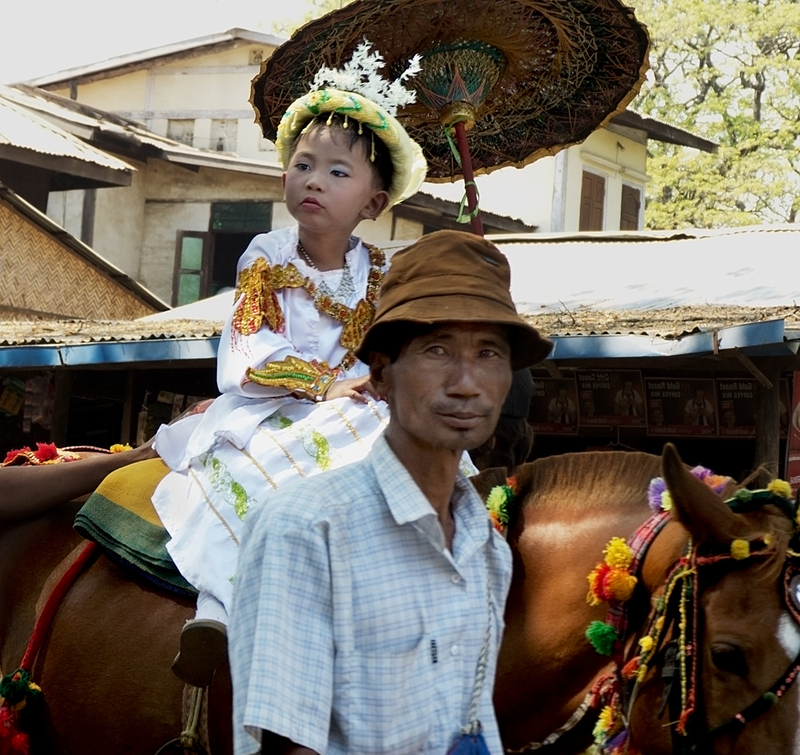 Each horse is accompanied by a man leading the horse, and another man holding an umbrella over the boy. 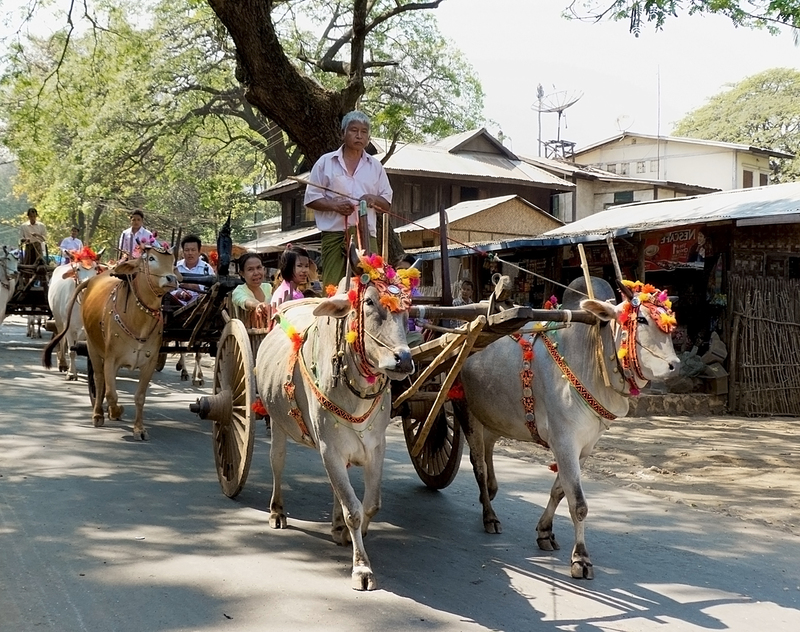 There is also a group of girls, maybe eight or nine of them, riding in ox carts following the line of horses. The girls are dressed in the sumptuous robes of princesses with extravagant headpieces. 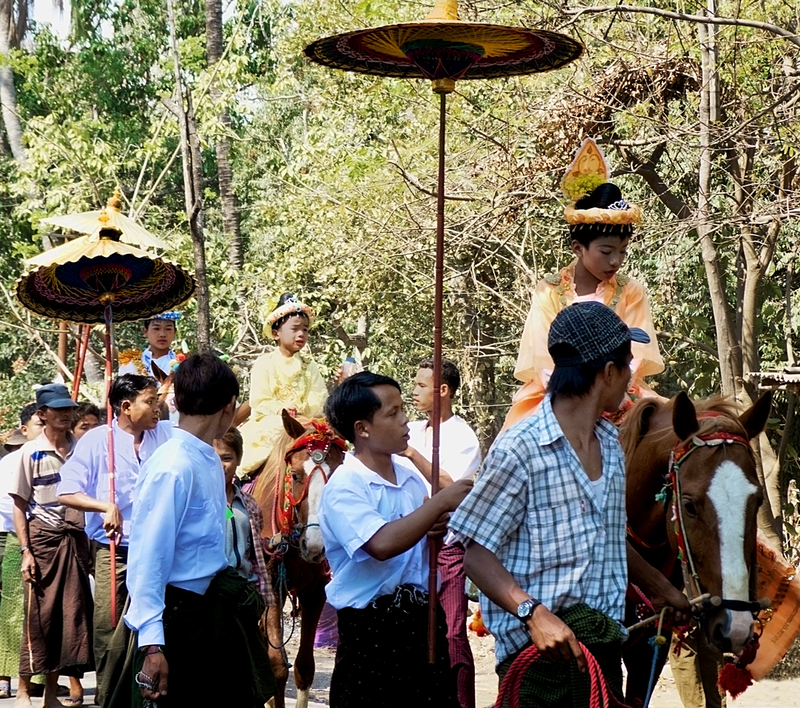 The oxen are also richly decorated with headpieces rivalling those of the girls. The girls will become nuns of course, but even then will not have the same status as the boys. 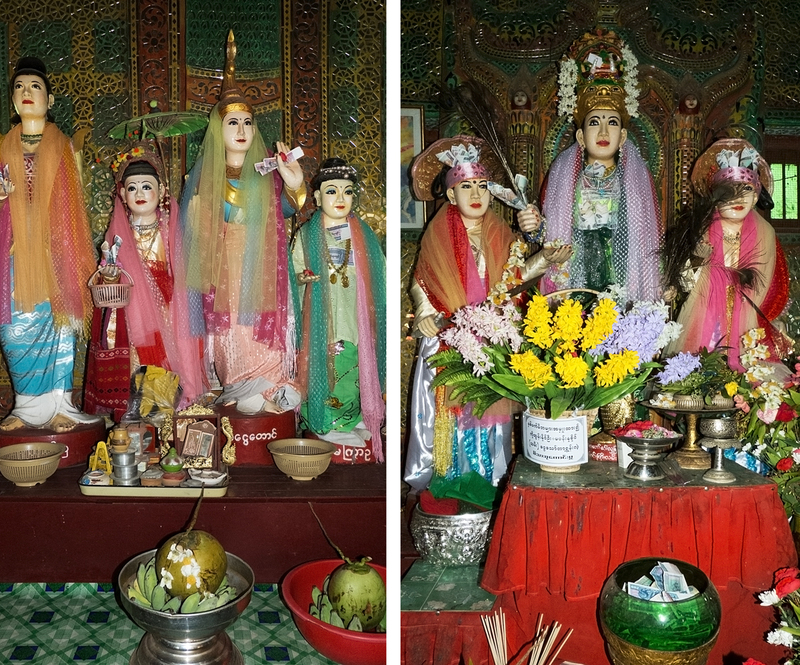 And then there are the families – all dressed in their finest clothes, carrying traditional begging bowls, and flowers. About twenty metres behind the parade is a big truck with a large loudspeaker blaring recorded music. Our driver (whose name is Koko) tells us that loud music is traditional at these ceremonies. The whole crowd is headed through the village in grand procession to the feasting hall. 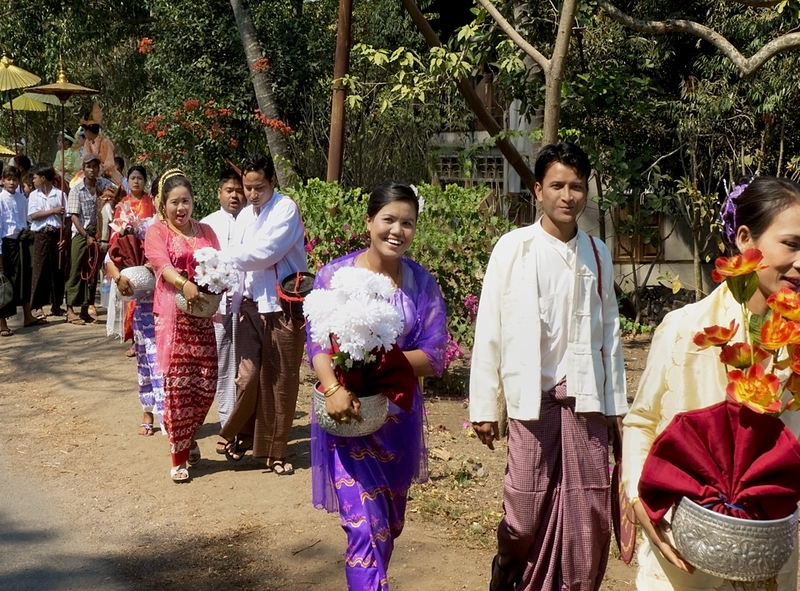 The atmosphere is electric, joyous, celebratory, a big day planned for a long time, and quite by chance, by grace, we find ourselves, once again, privileged, and equally joyous to witness a brief part of this truly authentic Burmese religious ceremony. We see it from a distance long before we reach the village at the base. It is prominent, majestic. Taungkalat is a sheer-sided volcanic plug topped by a Buddhist monastery and a shrine to the Mahagiri Nats, or nature spirits. 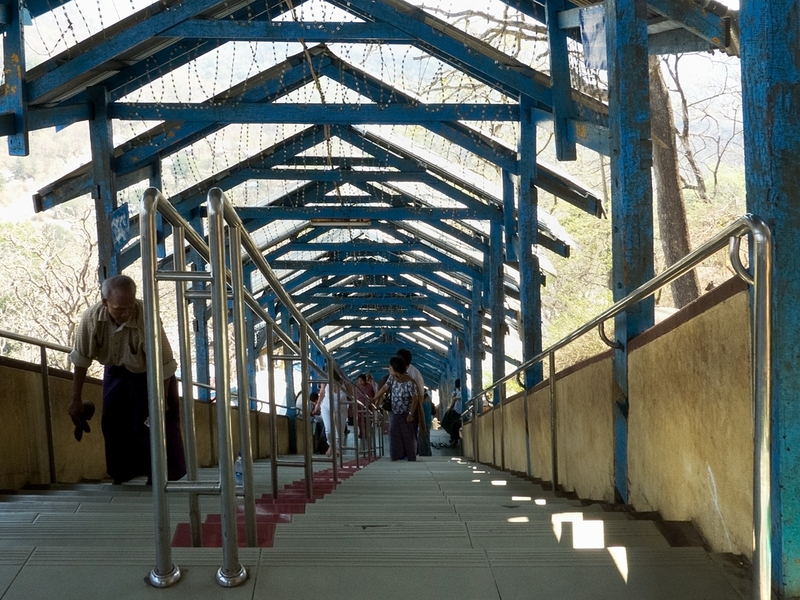 At one time a Buddhist hermit maintained the seven hundred and seventy-seven steps to the top. 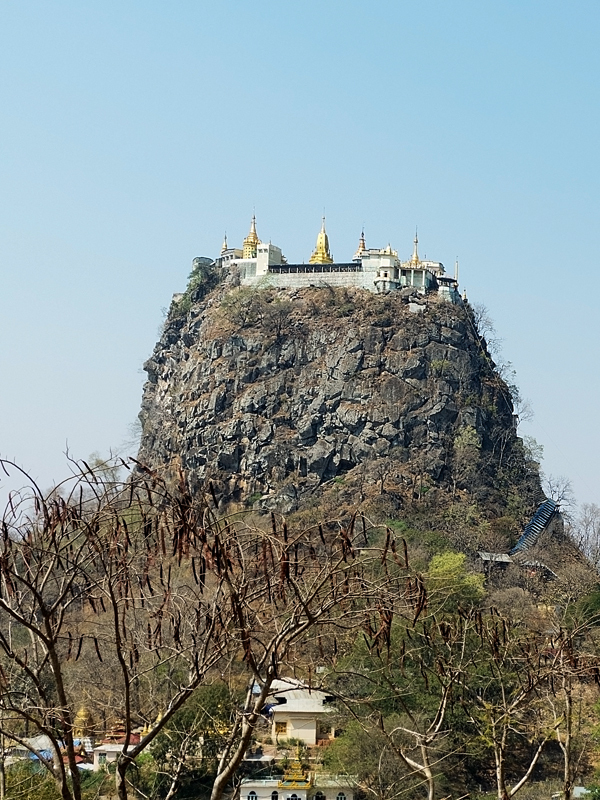 It is often called Mount Popa though that name actually refers to the volcano of which Taungkalat is part. 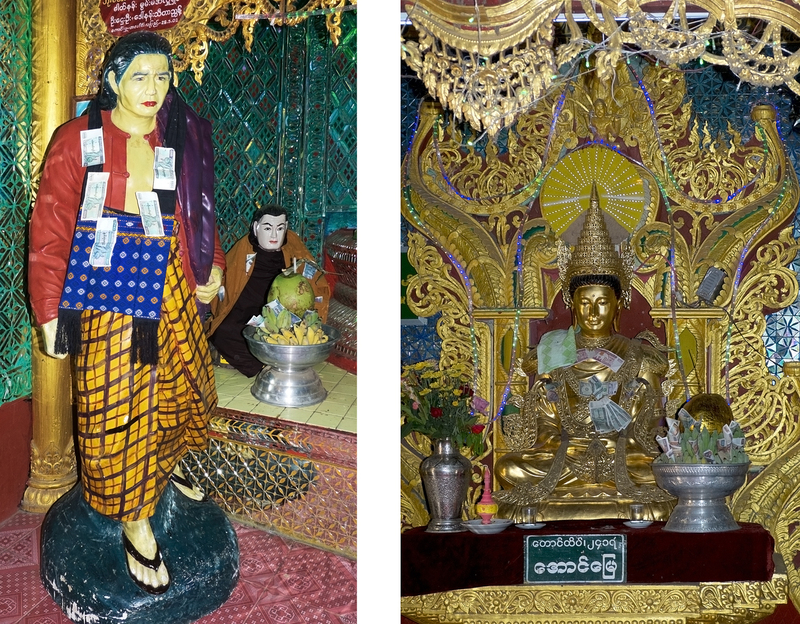 Mount Popa is the most revered home of the Nats, and the most important site for Nat pilgrimage. 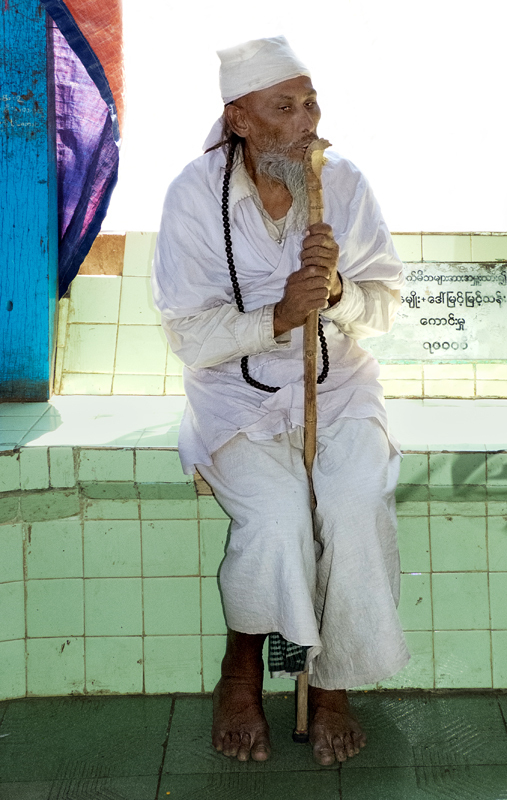 The ancient animist religion of nature spirit worship has been incorporated into Buddhism, especially so in rural areas. 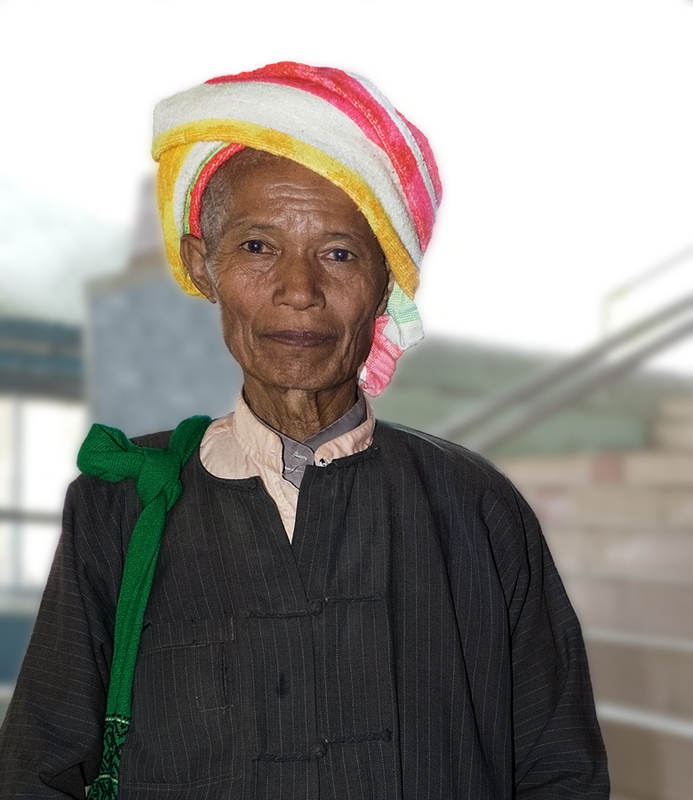 Almost all of the thirty-seven Mahagiri Nats were people who met a violent death. They range from the benign and helpful to the downright nasty. 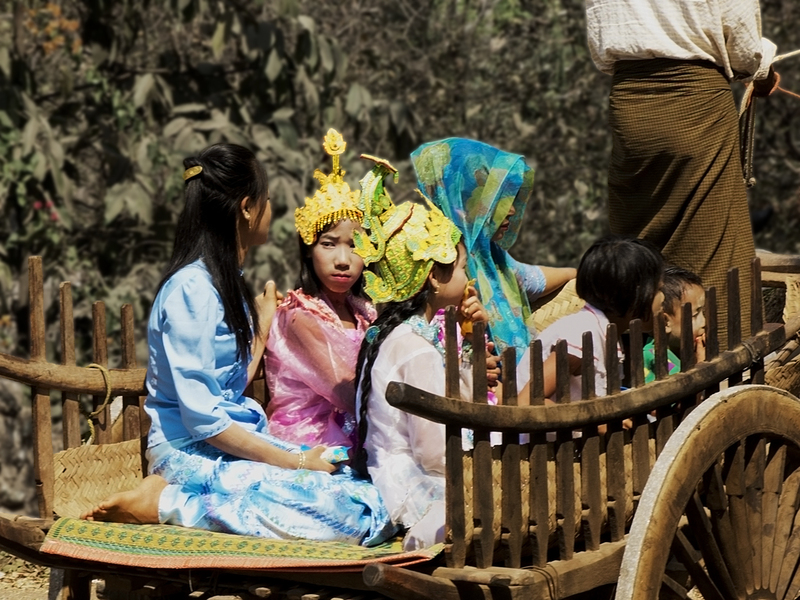 They were designated as Nats about a thousand years ago by a Buddhist king of Bagan. 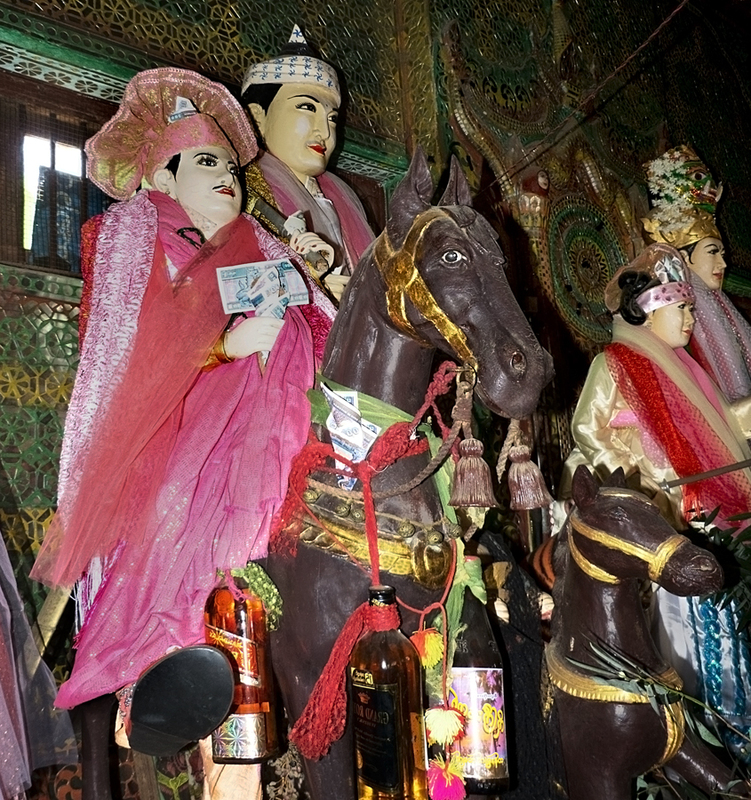 The king couldn’t get the people to give up nature worship so he brought images of the designated Nats into the Buddhist temples. Other Nats include forest and mountain guardian spirits. The Nats are believed to have human wants and needs and so offerings are made of food, flowers, even alcohol, and especially money. At the base of Taungkalat we came to this! And inside are all the Mahagiri Nats. Note the offerings of alcohol, and all the money. Presumably, hopefully, the money is used for the upkeep of the shrine and monastery. Don’t know what happens to the alcohol. Maybe those Nat guys get rowdy late at night. Koko found us a good stick to ward off the monkeys on the climb to the top. Seven hundred and seventy-seven steep steps – us and the hungry expectant monkeys, and the faithful. 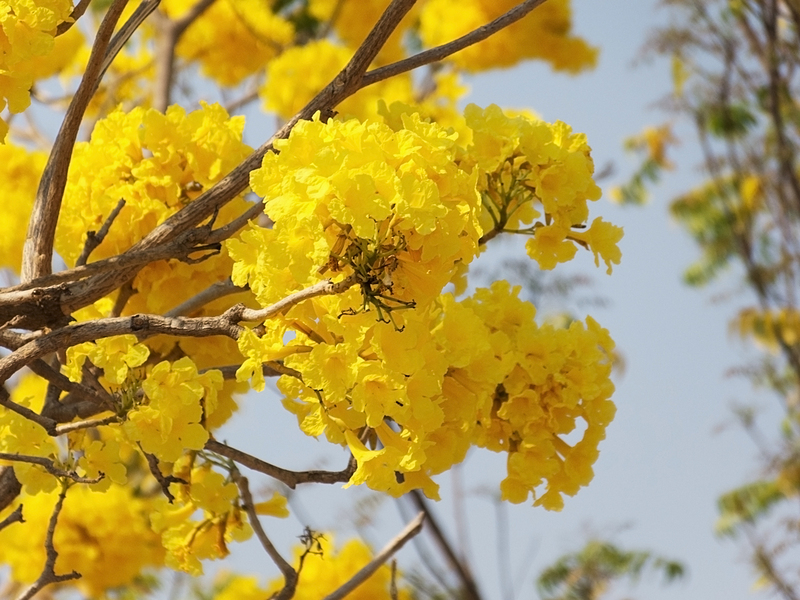 We saw these trees with their glorious golden flowers all over Laos, and again in Bagan. 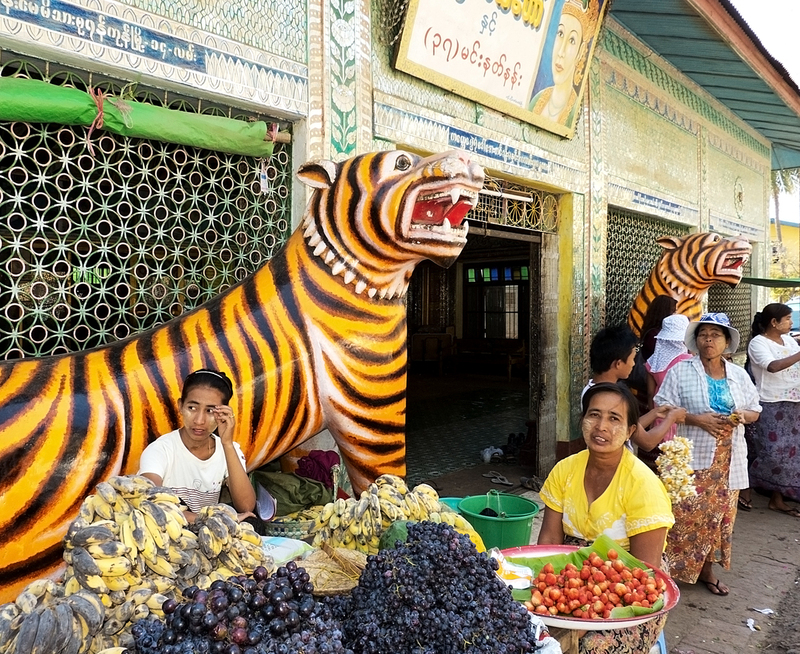 The next two or three posts will be about the Inle Lake area, absolutely the highlight of our visit to Burma. 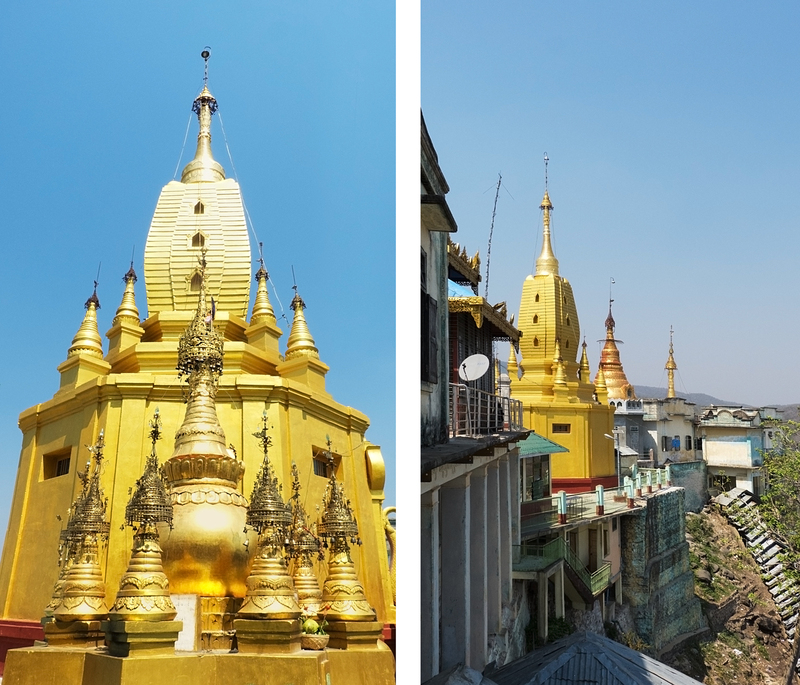 I have to say that nothing much beats Shwedagon Pagoda, but our three days exploring Inle Lake, and hiking in Shan State were extraordinary. Just as we (unknowingly) saved the best until last by finishing our time in India in Benares, we also saved the best until last in Burma. All words and images by Alison Louise Armstrong unless otherwise noted. © Alison Louise Armstrong and Adventures in Wonderland – a pilgrimage of the heart, 2010-2015. The facial expressions and vivid colors are what draw in time and time again. Thank you. Oh yes – it’s like that, the people and the colours – always drawing me in. So much richness, and life! Great post Alison! Never knew how palm sugar and peanut oil were made. 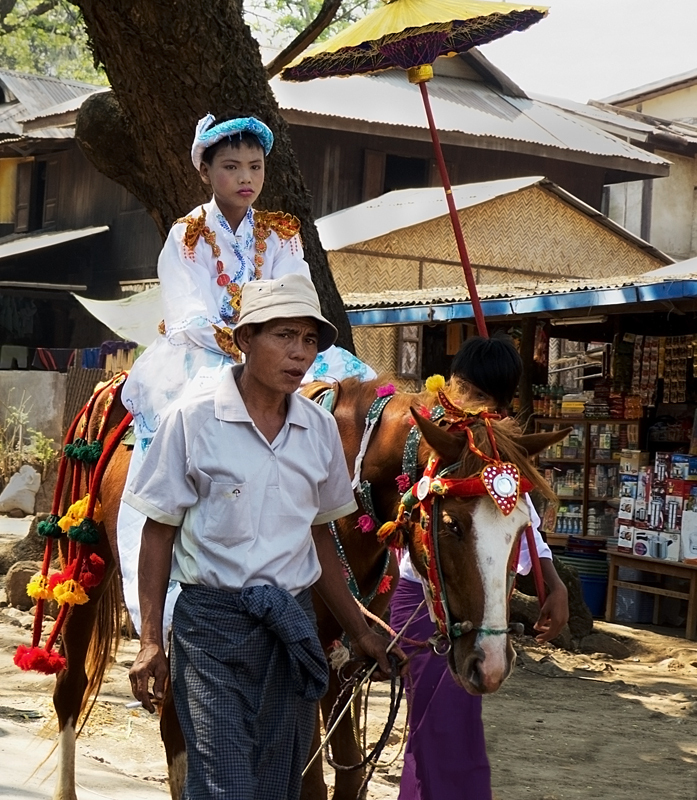 Really like the photo of the young boy asleep on his horse with papa (am guessing) smiling behind him. 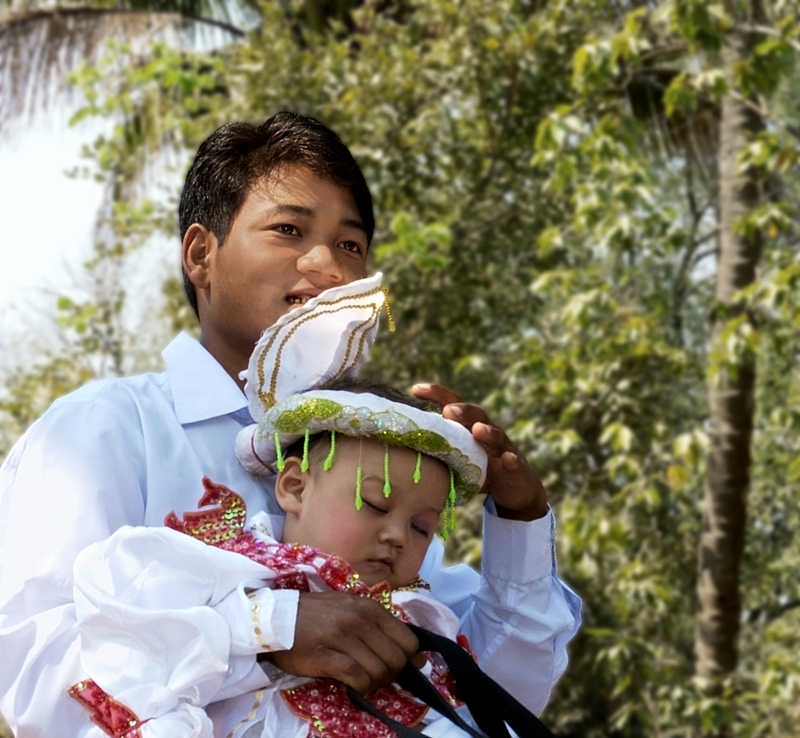 They seem so young to be going to a monastery, yet I know in many Buddhist countries it is traditional that one son be given. Traveling like you are, what a blessing, as the Unknown reveals itSelf in all so many marvelous forms. 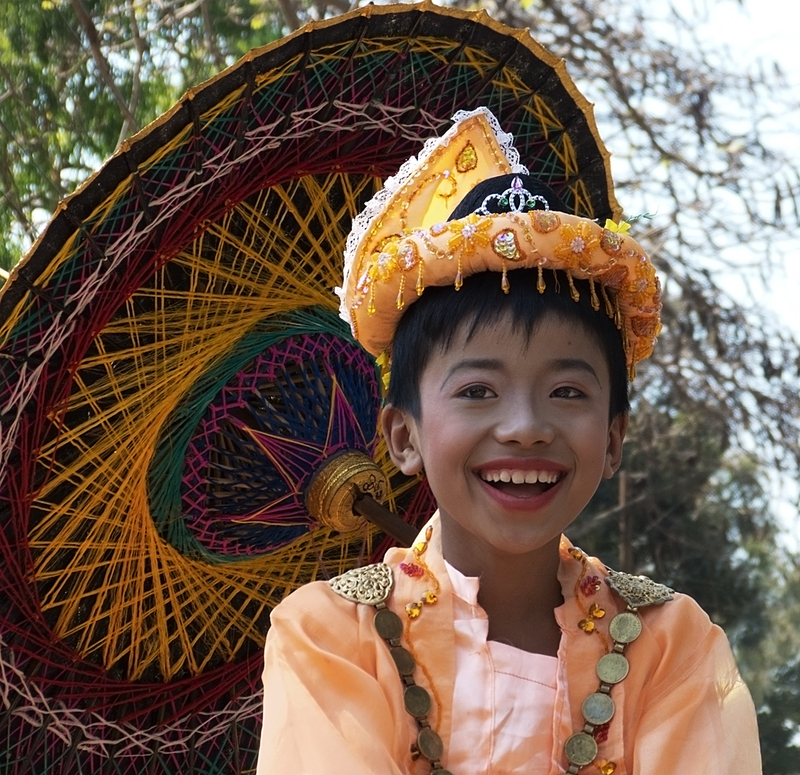 All the boys go into the monastery in Burma, usually sometime between the ages of 5 and 15. They may only stay a few days or a week, or sometimes a bit longer. It’s a kind of initiation into the religion. If they are to become monks for life they don’t join until they are 19. Your writing and experiences paint the most lovely picture of this adventure. I adore your photos here. There is so much being said through them. You captured the hearts of these people. I found myself staring at their faces, almost able to feel a part of who they are. Thank you so much. I am communicating something, and I do it for myself, I write to myself, and somehow that reaches other people, and that feels like such a blessing. Thank you. I love photographing the people – sometimes they know, sometimes not. They all have something to say, even without words. How incredible to see life on the other side of the world with its nuances and beauty, through your eyes. Thank you so much Angeline. It feels like a great blessing to be able to share it. Very well wriiten post with interesting pictures. Thank you very much Sapna.